New data released this morning on the mobile phenomenon Pokémon Go shows that the popular game isn’t only the biggest in U.S. history – it’s also breaking records when it comes to its ability to monetize and retain its users, as well. According to a report from SurveyMonkey, Pokémon Go is seeing retention rates at more than double the industry average, and is pulling in revenues at twice the average rate for casual games. The news follows earlier reports this week from a number of tracking and analytics firms which painted a picture of the app’s viral spread and significant traction. According to SimilarWeb, for example, the app passed Twitter in terms of daily active users on Android as of Monday, while another report from SensorTower said that users were spending more minutes per day in the Pokémon Go app than they were in Facebook. What the latest figures indicate is that Pokémon Go users aren’t just testing the waters – they’re addicted. SurveyMonkey estimates that just under 26 million U.S. users played the app on iOS and Android on Thursday, which is “unprecedented” for a mobile game, it says. Plus, more people are using the maps in Pokémon Go, which are powered by Google Maps, than they use the Google Maps app itself, says SurveyMonkey. Right now, Pokémon Go is rapidly finding its way onto new devices at a rate of 4 to 5 million installs per day, but this pace can’t continue forever, of course. That’s why looking at the app’s ability to retain its users is also important. So far, Pokémon Go is succeeding on this front as well, though it’s still early days. It seems that even the mildly curious are finding themselves immediately addicted. Around 7 out of 10 people who download the app return to it the next day, the report says. That’s extremely high for the industry – typically, games see 3 out of 10 people returning after the first day. In other words, Pokémon Go is seeing more than double the industry average retention rate for the time being. In addition, the app is raking in revenue at twice the average of casual games, the firm also found. 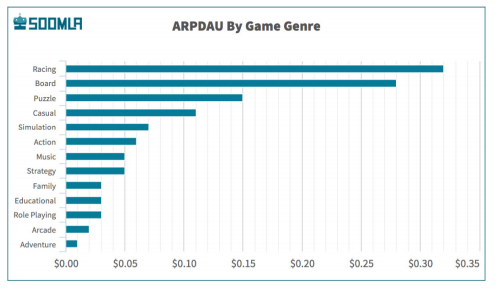 Its average revenue per daily active user (ARPDAU) – a figure that represents what people are spending in the game, averaged – is around $0.25. That’s more than the massively profitable hit Candy Crush, to give you an idea. Of course, what everyone is wondering now is when will the Pokémon Go hype wear off? Even hit titles tend to fade in popularity over time. For Pokémon Go, however, these new figures indicate that – for now, at least – it’s not having trouble keeping its players active, engaged, returning, and spending.